"Get immersed in a gang story playing a detective or a gangster"
The street is not the most appropriate place to grow up if what you want is to not have problems with the law. Freeze, the protagonist of 25 To Life, knows that well, as he is part of a gang in which too many bad things happen. He keeps doing illegal business with his colleague Shaun until his wife begs him to stop. And he must stop not just because she doesn't want him to keep on, but because of their son. What kind of example would Freeze be if he keeps killing people? He decides to leave the gang and tells Shaun, but his colleague betray hims. Then Freeze doesn't have another option than to take revenge. 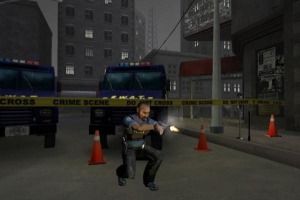 25 To Life is a game in which you will get into a gangsters' story, being able to be Freeze or Detective Williams, from the Police Department. This game has an interesting multiplayer mode in which you will get to play together with other 15 players from around the world. While playing this gangter game, you will listen to some hip hop music that will immerse you into this game.